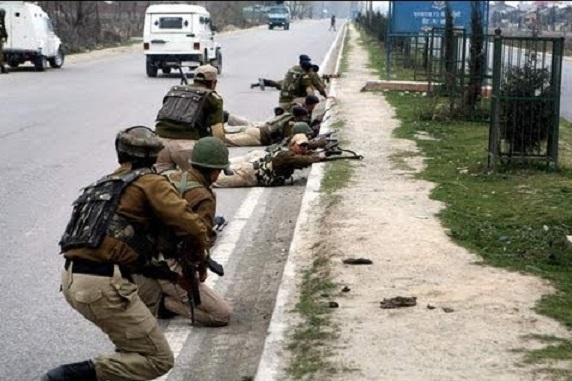 JNN 29 Nov 2014 Sri Nagar : Freedom Fighters wearing army uniforms on Thursday attacked an Indian army base near the border with Pakistan, leaving ten people dead in the worst militant violence in in more than a year. The incident came as Prime Minister Narendra Modi and Pakistani counterpart Nawaz Sharif had a brief meeting at a summit of South Asian leaders in Nepal that clinched a deal to create a regional electricity grid. He said four Freedom Fighters were also killed. The gunmen did not infiltrate from the Pakistani side of the border, a senior Border Security Force official said. “They came in a car to Arnia and took shelter in a bunker and targeted the army,” he said. The last major attack in Kashmir was in September last year, when nine people were killed in a gun battle a day after the leaders of the two countries agreed to meet on the sidelines of the U.N. General Assembly in New York. Four or five gunmen split into two groups upon arriving in the town of Arnia, about 4 km (3 miles) from the border, with one group attacking an army bunker and the other holed up in a house, a senior army officer said. India and Pakistan fought two of their three wars since independence in 1947 over Muslim-majority Kashmir, which they both claim in full but rule in part. Muslim separatists have been fighting Indian forces in the Indian portion of Kashmir since 1989. India accuses Pakistan of training and arming the rebels in the portion it controls and sending them to the Indian side, a claim its neighbour denies. The incident comes a day ahead of a visit planned by Modi to Jammu, where he will address two election rallies, which is sham elections as the Majority Muslim have boycotted the Election Process , and demanded for a Plebiscite , according to the UN Charter , under the Right of self-determination , as they have since indo-pak independence have voted for annexation of Indian Ruled Kashmir to Pakistan . The fighting on Thursday came as the leaders of India and Pakistan attended a regional summit aimed at boosting trade between almost a quarter of the world’s people. India and Pakistan exchanged their heaviest gunfire in a decade last month, killing more than 20 people. This entry was posted in Asia Pacific, Pakistan News and tagged Freedom fighters, india, india and pakistan, indian army, Indian Occupied Kashmir, Jammu and Kashmir Chief Minister Omar Abdullah, Minister Narendra Modi, pakistan. Bookmark the permalink.